Setting your alarm for a 3.30am wake up sounds pretty grim, but on the morning of our hot air balloon safari, I couldn’t have been more willing to leap out of bed. 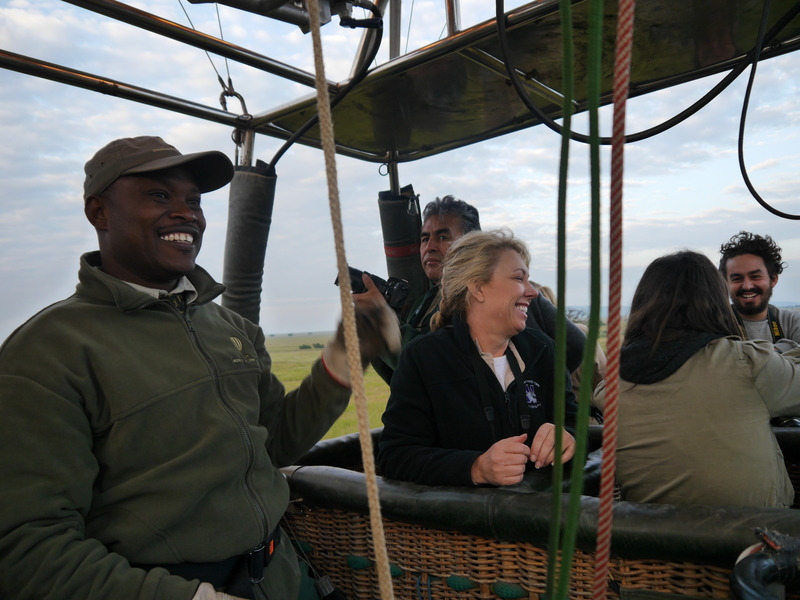 Soaring over the animals on a hot air balloon ride in The Serengeti is surely worth the early start? 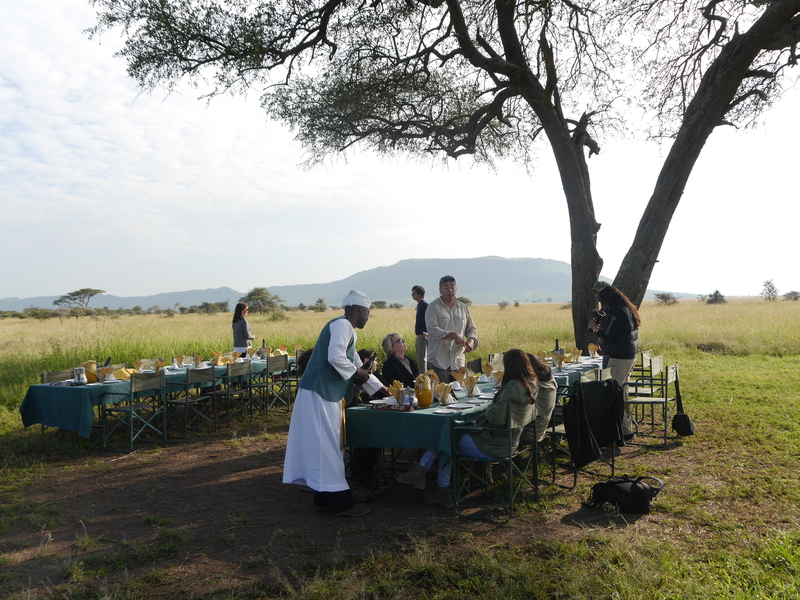 I met the group in the reception of the Four Seasons Serengeti lodge, where we could conveniently grab a coffee and a light breakfast for the road. I didn’t feel much like eating but I grabbed a stick of fruit to keep me going. Our friendly representative from Serengeti Balloon Safaris was much more awake than us and showed us to our pick up jeep. Pitch black outside, half asleep and slightly delirious, we all sat in silence as the jeep raced along the dusty track towards our launch site for the hot air balloon ride in The Serengeti. After an hour’s drive, we arrived to an open grassland in the Serengeti where teams were preparing the balloons for lift off. Two huge balloons lay on the ground with their baskets tipped on a side. After a safety briefing from our friendly pilot Abeid, we were instructed to clamber into the basket as it was still on its side. This was to ensure that everyone was safely in the basket before it began to move off the ground. Getting into the basket provided some decent comedy value as we all manoeuvred ourselves into our seating positions and the delirious giggles kicked in. The basket had room for 16 people excluding the pilot and was sectioned into 8 separate sections with room for 2 people standing in each. Once the giggles calmed down and we were all safely harnessed in, our captain began to blast the balloon with hot air. I was surprised at how close the huge flame was above our heads and the loud roar of the blast was a bit of a shock at first. Slowly but surely the balloon began to rise and our basket began to turn upright underneath the growing balloon. Our take off was surprisingly smooth and I didn’t even realise we had left the ground until I stood up and looked out of the basket. As we made our ascent the panoramic views became breath taking and we could see for miles into the distance. Aside from the occasional blast of hot air into the balloon, we glided through the air completely silently and smoothly. 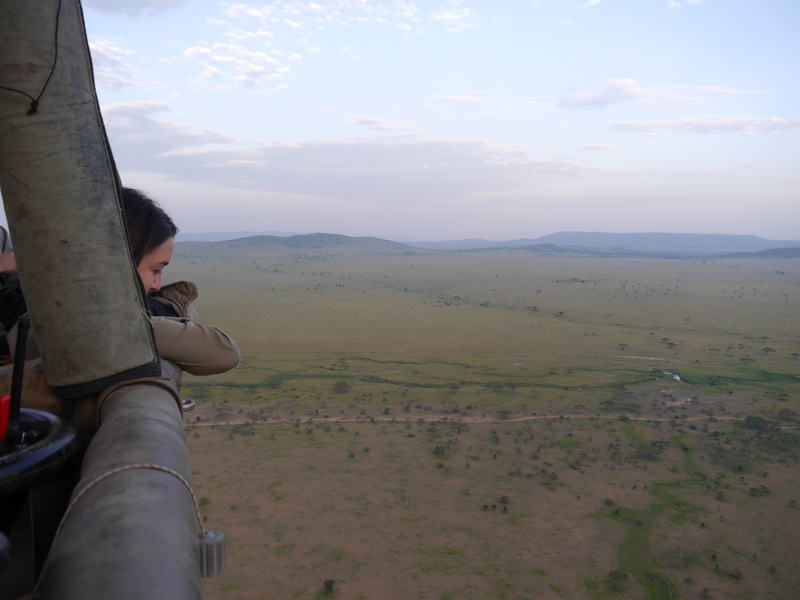 A hot air balloon ride in The Serengeti is totally un-invasive to the animals, which mean you have a great chance to see lots of wildlife from a unique birds eye view perspective. During our flight we saw running wildebeests and tonnes of baboons in the trees. I was hoping to see some elephants and maybe come cats, but when you’re dealing with nature you leave everything to fate and can never guarantee what you will see on the day. The best moment of the flight was when we low over a long river that was full of hippos. 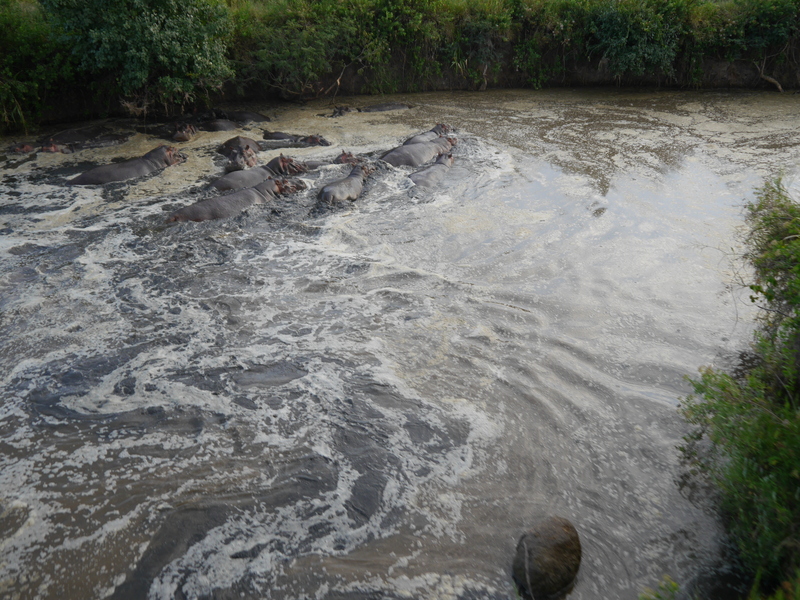 We we’re so low that we brushed over tree tops and being so close to the masses of hippos was an incredible moment. 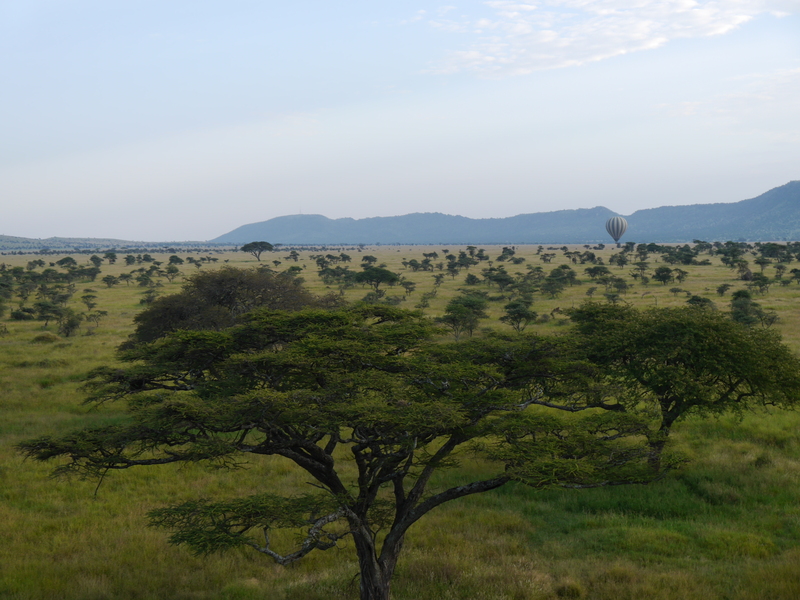 The hot air balloon ride in The Serengeti lasted about 40 minutes in total. When we landed we were greeted by the ground crew who welcomed us with a champagne reception (we had forgotten it was only 7am by then). 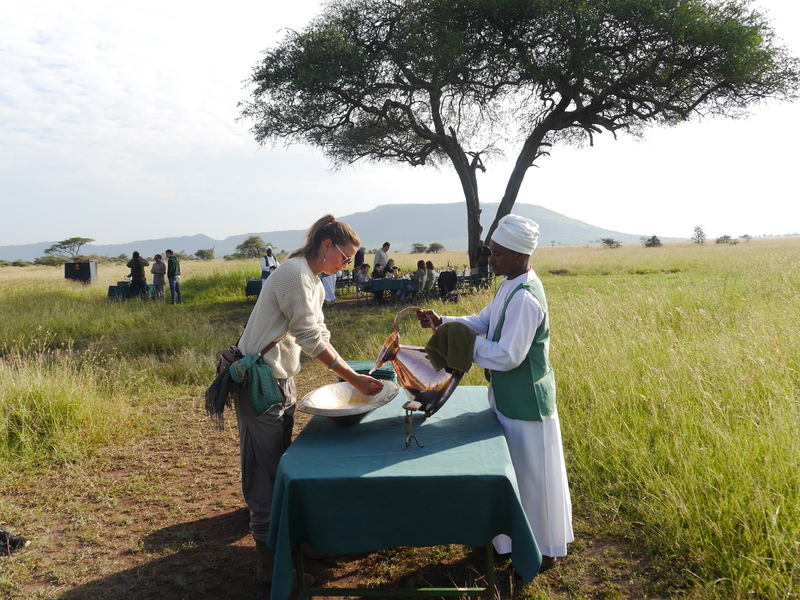 After our reception we were whisked off by jeep to enjoy a spectacular bush breakfast in the middle of the Serengeti. There were two long tables beautifully decorated and sitting under a tree that looked very picturesque. When we arrived we were given soap and warm water to wash our hands with that was poured out of a traditional Tanzanian copper jug. Everyone sat down with a huge sense of excitement and relief that we had competed the flight safely and our captain Abeid joined us to tell us more about his flight experiences as a hot air balloon pilot. We sat for an hour or so at the tables to enjoy a cooked breakfast, coffee, and a top up of bubbly. The atmosphere was completely serene and I remember thinking how much it felt like we had done with our day despite it being only 8am! My sunrise hot air balloon safari was a travel experience that I will remember for the rest of my life and it is a truly unique way to see the Serengeti. 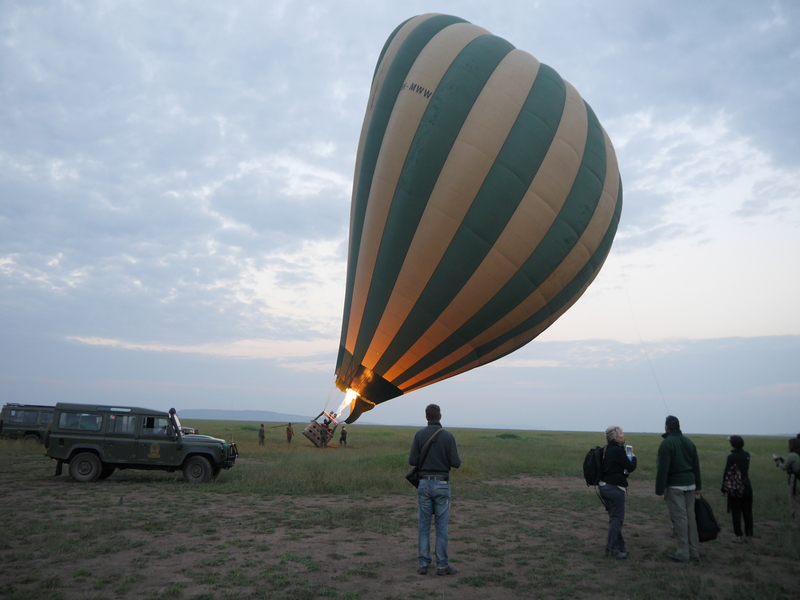 If anyone is visiting the Serengeti I can’t recommend this experience highly enough and if you do it, make sure you do it with Serengeti Balloon Safaris. What do they charge for the hot air balloon experience? Jess this sounds like an amazing experience! I would love love love to do this one day! I’m so glad you enjoyed the balloon ride; I knew you would love it! It’s my number one recommendation for anyone going on safari to see the animals from above as they act so much more natural than when on a game drive. So, so amazing…I would have been scared though but the breakfast and bubbly would have been a great reward! I have been up in a hot air balloon twice, but your trip looks like the best. Makes me want to visit Africa and see it all for myself. Amazing! 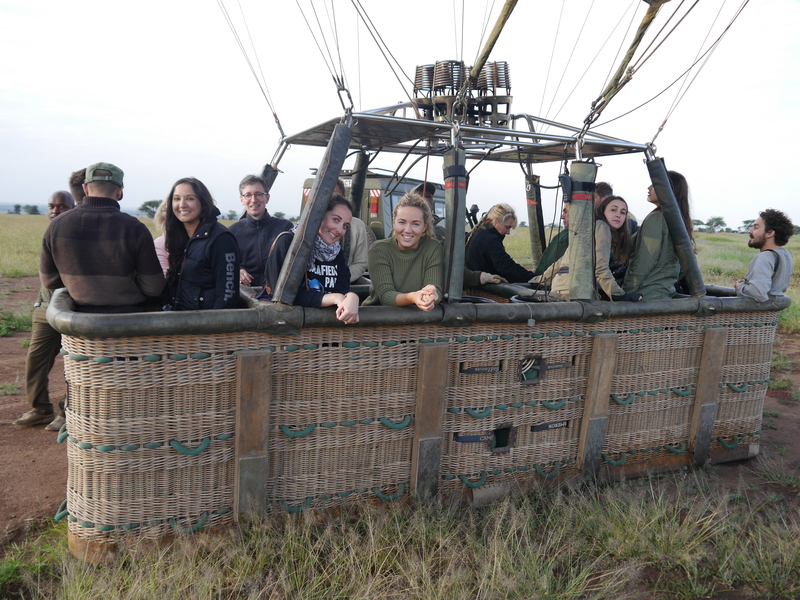 A hot air balloon ride is at the top of my list of things to do and doing it over Africa must’ve been incredible!